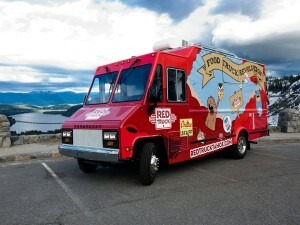 Red Truck – Truckee, CA (@RedTruckTahoe) – Food Truck Talk – Searching for the best foodtrucks! 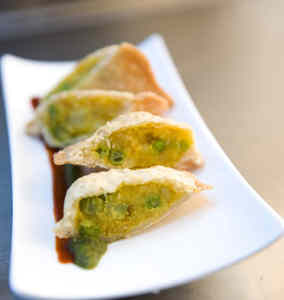 We often talk about those food trucks that are patrolling America’s largest cities. But there are also food trucks in less populous areas like The Red Truck from Truckee, CA, not far from Lake Tahoe. Hmm, I wonder what’s taller the truck or the amount of snow on the ground? Anyway, the Red Truck owner’s combine over 20 years of professional kitchen experience and have hit the streets with a big red truck that is serving sustainable, organic, eclectic eats. The food is ethnic, but not really focused on one ethnicity. The Red Truck offers a roasted garlic hummus with curry chips (just $3) as well as tacos with tzatziki, slaw, cucumber pico and crispy quinoa along with either adana pork, tikka masala chicken or gashi vegetables. Burritos and bowls are also available with similar ingredients. For dessert you can never go wrong with a red velvet cupcake. You can’t beat the variety at the Red Truck. It’s a combination of vegetarian, spicy food, indian, organic, turkish, lebanese and of course, cupcakes. Fun and quality all rolled into one!